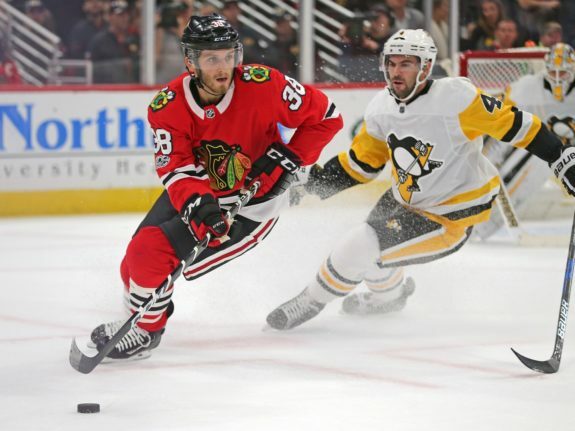 The Chicago Blackhawks trounced the two-time defending Stanley Cup champion Pittsburgh Penguins Thursday night at the United Center. The Blackhawks, following a longer-than-anticipated offseason, looked energized and intent to start the process of atoning for an abysmal first-round exit from the 2017 playoffs. The Penguins, on the other hand, looked like a team playing the second game of a back-to-back. In fact, coming off their banner raising ceremony and a 5-4 overtime loss to the St. Louis Blues last night at PPG Paints Arena, the Penguins were the first team in eight years to start the NHL season with games on back-to-back nights (according to Pat Foley of NBC Sports Chicago’s broadcast). Any judgments made about this 2017-18 Blackhawks team after their impressive season-opening win are likely to be an overreaction. But, it’s hard not to get a little bit of that old-time feeling about what transpired. The Blackhawks played fast, possessed the puck, were strong on the forecheck and limited dangerous chances in their own zone. 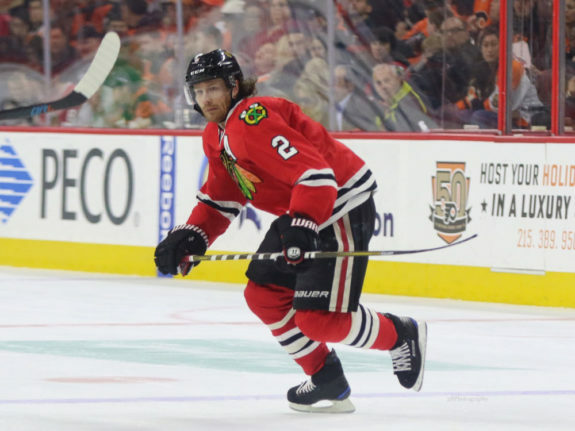 Duncan Keith and Brent Seabrook were reunited as the top defensive pairing. They finished a combined plus-6 and tallied two of the team’s three top time-on-ice (TOI) numbers at 23:11 and 20:25 respectively. Jan Rutta, who looked like he belonged in the NHL during his regular season debut, was on the ice for 20 minutes and 45 seconds. And how genuine would that old-time feeling be without the presence of Patrick Sharp and Brandon Saad? Saad looks poised for the dominant season that many have projected. He finished with a hat trick on five shots and looks very comfortable alongside Jonathan Toews and Richard Panik. Saad was expected to make Chicago’s top line better than they were at any point last season. That’s already coming to fruition. Patrick Sharp had a nice Chicago homecoming in his own right, tallying a goal on four shots and recording three takeaways. More importantly, Sharp appeared healthy and looked to have decent chemistry with his linemates Artem Anisimov and Alex DeBrincat. Other than Patrick Kane’s ridiculous skill set, which was more than evident on a backhand pass to Ryan Hartman for a first-period goal and a top-shelf goal against Matt Murray that seemed to find room where there wasn’t any, Nick Schmaltz was by far the most noticeable player on the ice. 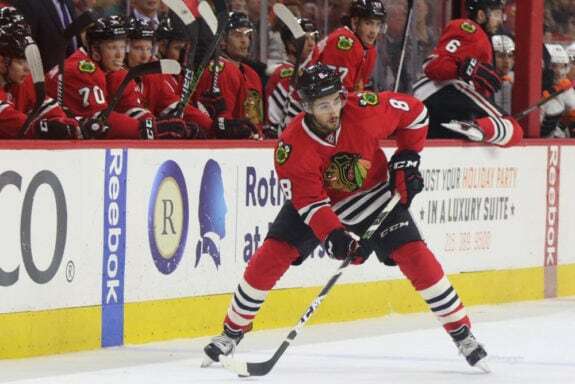 Schmaltz, who has garnered praise from head coach Joel Quenneville throughout the preseason, is quickly starting to realize the talent that many thought was present in the high-end prospect. Sounds a lot like the guy donning the number 88 sweater for the Blackhawks. As linemates, the creativity and talent level of these two were on display. If they continue to build chemistry and play complimentary to one another, this line will present constant problems for opponents throughout the season, and will make fans forget all about Artemi Panarin. It shouldn’t come as a surprise that a 10-1 victory on opening night comes with a few records and rarities. This kind of dominance doesn’t come along frequently in the NHL, let alone in season openers. The Blackhawks set a franchise record for goals scored in the first period of a season-opening contest (five). In addition, Chicago has never scored ten goals in the first game of a season. In fact, the last time Chicago scored ten goals was on October 12th, 1988 against the Winnipeg Jets. This game wasn’t all that far from representing the Blackhawks’ most dominant win in their 91-year history, which was a 12-0 victory over the Philadelphia Flyers on January 30th, 1969. At least a couple of individual accolades were also achieved. Saad’s hat trick was only the second of his career, with the first coming during his time with the Columbus Blue Jackets on Apr. 2, 2016 in a 5-1 over the Carolina Hurricanes. Patrick Sharp recorded his 600th career point. Ryan Hartman, who recorded five points (goal, four assists), bested his previous career-high of three points that came via a hat trick on Jan. 8, 2017 against the Nashville Predators. The night wasn’t all glamorous for the Blackhawks. Tanner Kero, the team’s fourth-line center, left the game late in the second period after what appeared to be a knee-on-knee collision. He did not return for the third period. Schmaltz also left the game in the third period after appearing to be in a significant amount of discomfort on the Blackhawks bench. After the game, Quenneville did expect that both players would be alright and likely ready to go against Columbus on Saturday night. The next couple of weeks don’t get any easier for the Blackhawks. Including the victory over the Penguins, Chicago’s first eight games of the 2017-18 season are against teams that made the playoffs in 2016-17. The Blackhawks will host the Blue Jackets on Saturday night at the United Center and then play back-to-back contests in Toronto and Montreal.